Start a class to run right now. A pop-up window will appear. To start the class right away, you'll want to choose the "Right now" option. 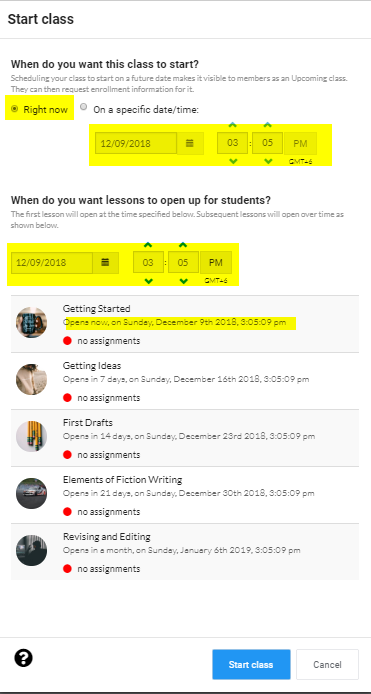 This will auto-populate the dates and times of the class opening, the first lesson opening, and then the dates of each lesson. Please note: You have the option of opening a class and delaying the first lesson. This way you could start the class a few days early and give students times to introduce themselves and get use to the class, before the first lesson opens. If you change the date of the first lesson starts, the dates for subsequent lessons will also be updated automatically.